Biodiversity, a contraction of the term “biological diversity”, appeared in the public sphere at the Earth Summit (1992). Two meanings are recognized in the word. The first in Life sciences concerns its biological component, while the second in Human and Social sciences is concerned with how society manages it, including consideration for its intrinsic value. The concepts of ecosystem functions and services make it possible to establish operational links between the biology of species and the welfare of society. Several factors of biodiversity loss, combined under the term “global change”, are serious risks to the well-being of societies that new forms of ecological governance should mitigate. Figure 1. How many species are there on Earth? Approximately 2 million species are currently described, but the actual number is probably in the order of 10 to 30 million. 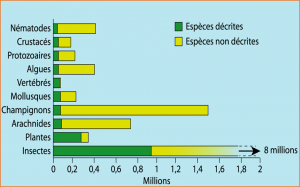 As illustrated in this figure, the number of species described varies greatly between groups. While vertebrates are fairly well known, although several species of mammals and birds are described each year, not to mention amphibians, reptiles and fish, the diversity of groups such as fungi, nematodes and insects remains very poorly known to the extent that a large part of the species in these groups will be extinct before having even been discovered and described. This balance does not take into account prokaryotes (organisms without a cell nucleus) such as bacteria and archaea, which number in billions of distinct entities or strains and whose functional role is fundamental to life. The neologism Biodiversity was coined at a forum on biological diversity held in the United States in 1986 in the context of a scientific community’s awareness of the worrying erosion of biological diversity around the world. But it was the United Nations Conference on Environment and Development, better known as the Rio de Janeiro Earth Summit in June 1992, that popularized the term among the general public and the media. Initially defined as the diversity of ecosystems, species (Figure 1) and genes in space and time, as well as their interactions within and between these organizational levels, it is used in such a wide range of situations that it is no longer possible to give it a formal and simple definition that is accepted by all. Actually, the word “biodiversity” has two complementary meanings. The first is to consider biodiversity as a hierarchy of entities (genes, individuals, populations, populations, species, ecosystems) organized as interactive systems in perpetual evolution (dimension of time), driven by dynamics (dimension of space) and performing functions. This definition reflects three essential concepts, namely, the interactions between elements of biodiversity, their dynamics in space (i.e. ecology) and their temporal trajectory (i.e. evolution) (see What is biodiversity?). The second is to consider biodiversity as a social, economic, legal, political and philosophical construct whose challenges are related to its interactions with human societies: access to resources, uses, benefits, sharing, management, sustainability. From an operational point of view, biodiversity is therefore a scientific priority aiming at understanding its genesis, evolution, organization and functions within ecosystems, as well as stopping its erosion whenever and wherever possible. This is what the scientific community in the Life Sciences is doing. But it is also an economic and social issue because of the biological and genetic resources it represents, which must be valued and shared equitably at the level of individuals and States. Finally, it is an ethical issue because it raises the question of the right to life of species, which can be considered imprescriptible, as advocated by several active philosophical currents such as environmental ethics. Environmental ethics raises the question of the legitimacy of Western anthropocentrism in the construction of standards for the exploitation and management of species and natural systems. According to a non-anthropocentric vision, every living being is a “teleological centre of life” and must, as such, be considered as an end in itself, a necessary and sufficient condition for it to be recognized as having an intrinsic value that makes it a subject of moral consideration. It is in this context that a philosophical cleavage emerged between several postures, in particular between “biocentrism” which defends the living, every living item, at the individual level and “ecocentrism” which advocates the integrity of the biotic community, a complex ecological system that includes all the organisms that compose it, including humans. Ecocentrism is currently a preferred option for thinking about the relationships between human societies and natural systems. Biodiversity is therefore also explicitly part of the Humanities and Social Sciences. 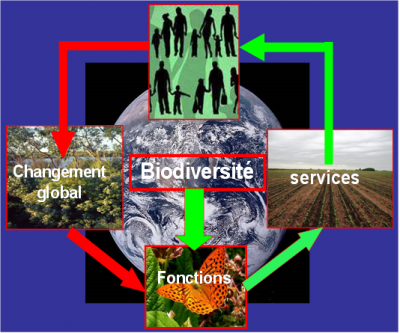 For a long time compartmentalized, biodiversity research is currently tending to integrate functions and services, particularly following the work of the Millennium Ecosystem Assessment prepared at the initiative of the UN for the Convention on Biological Diversity (CBD). This international treaty, adopted at the Earth Summit in Rio de Janeiro in 1992, aims to (i) conserve biodiversity, (ii) ensure the sustainable use of its components and (iii) share fairly and equitably the benefits arising from the use of genetic resources. The CBD is a key document for sustainable development in which biodiversity is considered a key issue. Since 2012, the Intergovernmental Platform on Biodiversity and Ecosystem Services (IPBES), launched by the United Nations Environment Programme (UNEP), is bringing together a panel of experts launched as a group something like the Intergovernmental Panel on Climate Change (IPCC). The logic of the relationships between biodiversity and human societies is based on the concepts of ecosystem functions and services (Figure 2): functions are the basic processes that support ecosystems such as pollination, primary productivity, relationships between trophic levels (food chains), organic matter recycling, population regulation, etc. Services are the benefits that humans derive from these functions, namely everything they need to feed, clothe or health themselves, but also a multitude of services such as climate regulation, water purification, carbon sequestration, pathogen control, etc. When pressures on ecosystems are excessive, they degrade through loss of species, disruptions of interactions, and thus alteration of functions and impoverishment of services. The erosion of biodiversity is now a major concern everywhere on Earth. While the disappearance of species at a rate never seen before in human history is rightly deplored, the most worrying and pernicious effect of this erosion is the fragmentation in space, genetic impoverishment and the disappearance of local populations at the landscape level, a kind of fraying of the fabric of life that affects the functioning of ecosystems. Figure 3. The different types of values recognized for biodiversity. According to Chevassus-au-Louis et al (2009). 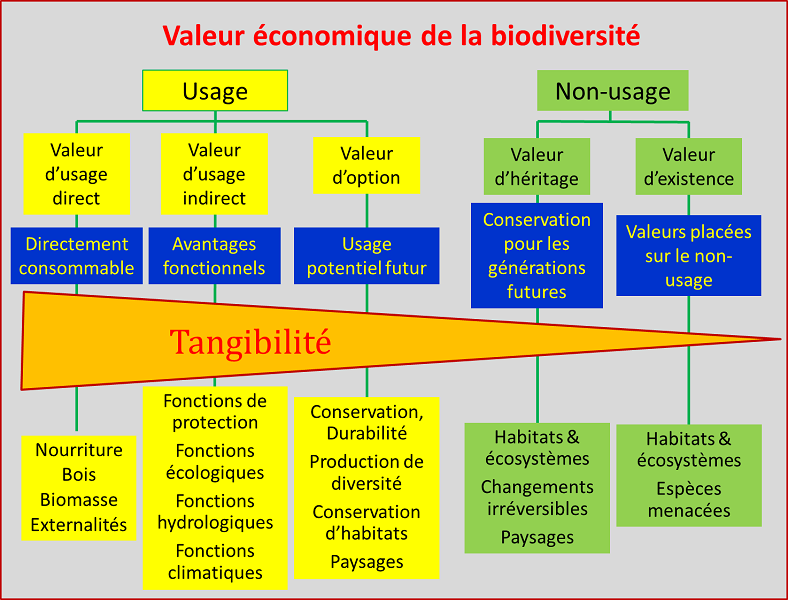 In line with the notion of services and capital attributed to biodiversity, but also admittedly for conserving it, the economic world has captured the concept to assign various levels of values, which is not without difficulties because the different meanings of the word value can lead to contradictory practices (Figure 3). When we monetize the value of a biodiversity entity through a financial transaction, the value we attribute to it has nothing to do with the value we recognize it as a unique living entity. The term “global change” refers to all the factors of degradation resulting from excessive pressure on ecosystems, this pressure having become such as the term “AnthropoceneNeologism associating the Greek words “man” and “recent”, coined by the meteorologist and atmospheric chemist Paul Crutzen, Nobel Prize for Chemistry in 1995, to designate a new geological era. The anthropocene would have begun with the industrial revolution and would thus succeed the Holocene, the geological era after the last glaciation and which covers the last ten millennia.” as been coined as a new geological era marked forever by a human footprint whose effects are felt throughout the planet. The global change is divided into six main components: (i) habitat alteration and fragmentation, (ii) pollution (in all its forms), (iii) chemical inputs (pesticides, fertilizers), (iv) invasive species (including GMOs), (v) overexploitation of resources, and (vi) climate change. These pressures lead to biodiversity loss that is difficult to estimate but can be assessed by several metricsUnits or measurement indicators used to judge the effectiveness of an activity.. This erosion is such that we are talking about a sixth major extinction crisis, the other five having spread from the Devonian (370 million years before the present) to the latest at the end of the Cretaceous (65 million years). The latter led, among other things, to the extinction of dinosaurs but encouraged the development of birds and mammals. For many reasons that are now well known, the well-being of human societies depends on their integration into ecological systems that are as functional as possible, which requires new and more environmentally friendly management standards. Conservation science helps to define these standards and provides the expertise necessary to develop effective policies for managing space and species. At the institutional level, many measures are being taken or are in the process of being taken at the European Union level. This is the case, for example, of the 1992 Habitats Directive and its network of protected sites Natura 2000 and the 2009 Birds Directive. France has committed itself to biodiversity through numerous initiatives, notably through the 1976 law on the protection of nature and then through the laws of the Grenelle de l’Environnement, in 2009 and 2010. A project for a green and blue grid has been launched in 2007. More recently, Law for the Reconquest of Biodiversity, Nature and Landscapes (2016) has been accompanied by the creation of the French Biodiversity Agency, a place of expertise and management of biodiversity that will contribute to the implementation of the National Biodiversity Strategy. Another effective research and expertise tool is the French Foundation for Biodiversity. 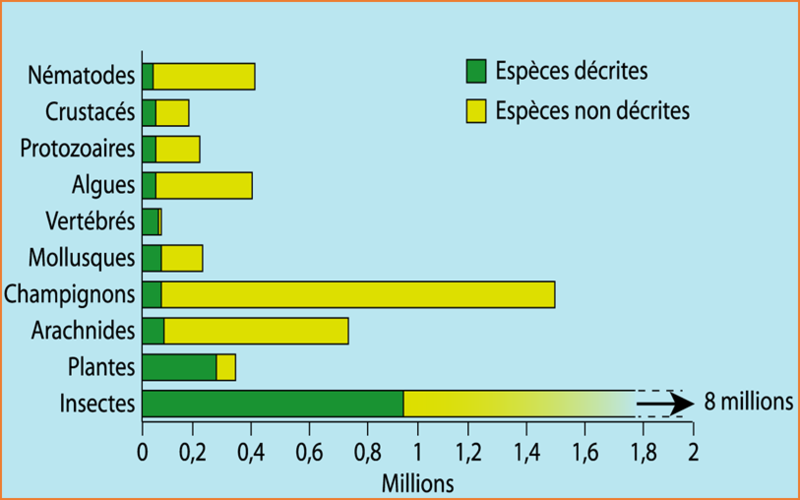 It is to be hoped that all these measures will bear fruit, which is not yet the case, as the trend indicators do not yet show, but with local exceptions, any improvement in the state of biodiversity worldwide. 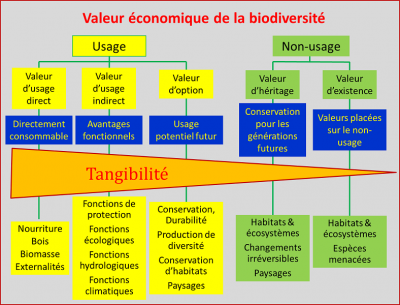 To cite this article:	BLONDEL Jacques	(2019), Biodiversity is not a luxury but a necessity, Encyclopedia of the Environment, [online ISSN 2555-0950] url : https://www.encyclopedie-environnement.org/en/society/biodiversity-is-not-a-luxury-but-a-necessity/. Blandin, P. 2009. From nature protection to biodiversity management. Versailles, Quae. Devictor, V. 2015. Nature in crisis. Think about biodiversity. Paris, Seuil. Wilson, E. O. 1993. The Diversity of Life. Paris, Odile Jacob.